Who is the author of CodeBreakers® and what is their experience? CodeBreakers® has been developed over the past 10 years by Georgina Smith, who is an experienced dyslexia tutor and assessor. Georgina is a member of PATOSS and has AMBDA status from the British Dyslexia Association. Georgina has run an independent practice for over 10 years working with students of all ages referred by their family and through both mainstream and non-mainstream schools. Georgina has provided inset training to schools and is the co-founder of SEN Jigsaw Conference. As members of her family have struggled with dyslexia over the years, she is passionate about supporting children and adults with dyslexia, ensuring they maximise their potential and develop literacy skills to enable students to become independent, confident readers and spellers. Georgina has completed CPD in various overlapping SEN/SPLDs and has a particular interest in Visual Processing (VPD), Auditory Processing (APD), Complex Language Difficulties, Sensory Processing (SPD), Autism (ASD), Pathological Demand (PDA), Dyspraxia and Retained Primitive Reflexes. CodeBreakers® is a systematic synthetic phonics, multi-sensory, structured, cumulative literacy programme. Your child will learn to sound out and blend words. They will work on sounds/phonics but also the logic and patterns of how to build words to help read and spell. The step-by –step approach to building knowledge, ensures your child is only asked to read and spell words using sounds they have been introduced to. You’ll be shown how to deliver CodeBreakers® making the most of delivering the programme through sight, sound and play. My child doesn’t have a dyslexia diagnosis can I use CodeBreakers®? CodeBreakers® is for students with dyslexia and those who want to improve literacy skills. Your child does not need to have a diagnosis of dyslexia to use the programme. How will I know where to start on the programme? You will receive a FREE baseline test which does not require any preliminary qualifications to use. The forms are quick to complete and are mapped directly to the programme and curriculum. How much time per week do we need to spend practising CodeBreakers® at home? Work with CodeBreakers® as little or often as you wish in the week. You can repeat games on a daily basis if you like. If you prefer, don’t study one day and just play a game, that’s great. Don’t worry if you miss a day or two, hobbies are important. Overall we would recommend it takes 90 mins on average to complete a workbook but we would strongly recommend that this is not completed in one sitting. Students need time to absorb information. Think quality not quantity. Practice 2-3 times a week for 20-30 mins. CodeBreakers® is all about taking things at your own pace. Don’t compare to other students. Over learning is the key to learning. Which age group is CodeBreakers® for? CodeBreakers® is aimed at students of all ages and abilities from 5 yrs to post 16. It successfully helps children of all ages, it’s written in a way that appeals to both younger and older students and gives you the freedom to adapt games to suits your child’s needs and interests. CodeBreakers® maintains the interest of primary school students as you can include learning through play. CodeBreakers® is excellent for secondary school students and post 16 students, its plain text format without the pictures, removes the stigma often attached to developing literacy skills. CodeBreakers® is also used with school leavers in FE and apprenticeships. Many adults may have not received the opportunity to develop reading and spelling skills. This is a comfortable way to do so at home. Who can deliver it and use CodeBreakers®? CodeBreakers® has been designed to enable parents, carers or partners to deliver it. It is highly structured and provides all worksheets, answers and flashcards. The easily laid out Instructor’s Manual guide is also provided so that the ‘tutor’ is aware of how to best complete the worksheet or game, which principles it develops and how to make the most of the multi-sensory experience to ensure that information is stored and retrieved to develop independent and confident learners. Will my child engage with CodeBreakers®? Students have used this programme for 1:1 tuition and repeatedly attended lessons and had fun! There are lots of games to engage younger students and it removes the feeling of doing homework at the dining table, to having fun. You can even include all the family in games, if you wish. Younger and older siblings can join in and this helps all the family, allowing parents to manage time and removes the stigma of feeling ‘extra work’ needs to be completed. The programme can be adapted for older students, with less emphasis on play, although even our older students love a game of bingo! As there are no pictures, this removes the sense of ‘additional support’ which stops some older students engaging in some programmes. Each workbook is structured and cumulative which means that students are only ask to read and spell sounds they have discovered at previous levels. Therefore they have a positive experience completing each workbook. The spelling rules and sounds are provided with every workbook to enable a full understanding of the sound and how to select the correct spelling pattern. Each chunk of sound is also isolated to enable students to understand how to identify and say a chunk of sound. The sound presentation gives a step-by-step guide to each sound, which is mapped to each book in the series. My child doesn’t attend mainstream school, is CodeBreakers® suitable for them to follow? CodeBreakers® has been used with students who have dyslexia, students without dyslexia, students who attend mainstream school, students who do not attend mainstream school and students with additional and complex SPLDs. Due to the multi-sensory approach this ensures that students have the best opportunity of retaining the information. CodeBreakers® has been used with children of all ages who have Global Development Delay, Autism, Dyspraxia, ADHD, Dyspraxia, Pathological Demand Avoidance (PDA), receptive language difficulties, audio and visual processing difficulties. The great thing is CodeBreakers® works at their pace and gives lots of opportunity for over learning. These principles ensure that students will store and retrieve information effectively and become independent readers and spellers, not reliant on whole word recognition. There are many synthetic phonics programmes available, however I firmly believe the success of the programme is in the delivery too. The deliverer needs to understand the principles of what they are delivering and maintain the continuity and standard of delivery which makes CodeBreakers® successful. My child has visual processing difficulties, sometimes they don’t read words accurately, does it help? CodeBreakers® is written in a dyslexia friendly font and can be printed on a specific colour paper to reduce visual stress. Visual stress can sometimes cause letters to be swapped or text to ‘dance’ when reading, resulting in words being read incorrectly. My child has difficulty with phonics and sometimes can’t hear sounds in words correctly, does the programme help? CodeBreakers® works on phonics, however gives significant opportunity for over learning which is often missed. CodeBreakers® also works on a logical method, enabling students to understand where to use patterns in spelling and understand how letters change sound in relation to other letters in reading and spelling. Students are asked to proof read and check work as part of a task and describe the rules to help them understand why words are spelled incorrectly, worksheets also help students understand morphology and etymology which looks at how words are built and how to understand their meaning. They’ll also develop vocabulary skills providing a semantic link and personal meaning of words, ensuring learning takes places on a number of levels. My child has not had a positive experience of learning to read and spell and finds it difficult to engage in learning, does the programme help? CodeBreakers® builds confidence and keeps students of all ages engaged. It is also a fun way to learn. CodeBreakers® has bite-sized work sheets, tasks are quickly completed with immediate feedback. The consistent lay out of the workbooks means your child will begin to anticipate how to complete the works, as they are solely working on one sound/pattern they can begin to build their skills using this pattern/sound and have a positive experience. CodeBreakers® workbooks constantly swap between visual, auditory, analytical, discovery, spelling, reading, writing and games tasks ensuring when learning different parts of the brain are stimulated, this ensure the sound/pattern is learned and remembered. My child struggles to read whole words, will this help? Students who have followed CodeBreakers® don’t simply learn whole word recognition of high frequency words, they develop knowledge of words through the pattern, learning how to add suffixes and understanding the root word. Students are able to analyse sounds and the patterns of letters which make sounds, to apply logic and transfer this knowledge to other, less familiar words. This enables students to access a wider wordbank and are not solely reliant on trying to recall high frequency words. My child struggles each week to recall words in spelling tests, how will CodeBreakers® work? Traditionally students are asked to learn 10 spellings per week from the National Curriculum. Usually these are taught by “Look, say, cover” methods. Students are essentially recalling what the whole word looks like rather than understanding each ‘component part’ of a word and how a word is made up of sounds, syllables and possibly suffixes. Students using CodeBreakers® will learn how to encode words by sounding out words and making a written response for each sound. Unless you want to use your own games to add to the play sections, resources are included. The pack includes printable flashcards and games. You will need a set of wooden letters to build words, a dice for games, coloured pens and paper and card for printing workbooks and games. How does CodeBreakers® transfer into school work? We always suggest that when reading and spelling school work, you try to identify the key sounds you and your child have worked on together in CodeBreakers® and identify/highlight them in text. I have no knowledge of dyslexia, can I use CodeBreakers®? The Workbooks and Instructor’s Manual provide all the information on how to successfully deliver CodeBreakers® programme and therefore requires no training. There are additional Lesson Plans which are usually for schools but if you wish to be provided with more prompts and a structured method to record each task, you can opt for these too. The FREE Instructor’s Manual discusses the principles of the programme and how to successfully deliver the multi-sensory programme for each task in the workbook. All the preparation has been completed, so there is no need to find resources from various programmes, you can simply pick it up and start to use once you’ve read the brief manual. Each work book will offer regular worksheets, which enables you to gain confidence in how to deliver the programme and your child will be encouraged by their success, due to the familiarity of the work. Is there a lot to learn for me to use CodeBreakers®? The programme is supplied in PDF format which means you can read it on your laptop/tablet and even use text to speech software to read the manual to you if you like. You’ll enjoy learning the principles of how to support your child. It’s written with parents in mind, so we hope it’s friendly and accessible. You’ll find all the jargon detailed too. CodeBreakers® is available to individuals as a Home Edition and schools/education providers as a School Edition. What should I tell my school about CodeBreakers®? Students of all ages enjoy using CodeBreakers®. The structured workbooks quickly build confidence as students become assured, knowing how to complete workbooks and quickly are able to become independent learners. Students are able to successfully complete workbooks with instant positive feedback, which provides both intrinsic and extrinsic motivation. This means you can reward your child through positive praise and feedback. Your child can also self motivate by identifying themselves, that they have been successful and realising their own progress and how they can begin to build their knowledge of words and apply to school work. The highly structured programme provides a clear scheme of work for students, which can easily transfer to ILP/IEP targets, Pupil Passports/Plans, reducing planning time. Schools can opt for the Lesson Plan Pack, which maps all workbooks to a pre planned and prepared lesson, again reducing planning time. Answers to workbooks are provided on each page, providing instant feedback and reducing marking time. CodeBreakers® is mapped to the National Curriculum, so it’s easy to track and find the workbook to use to target a specific sound/pattern. 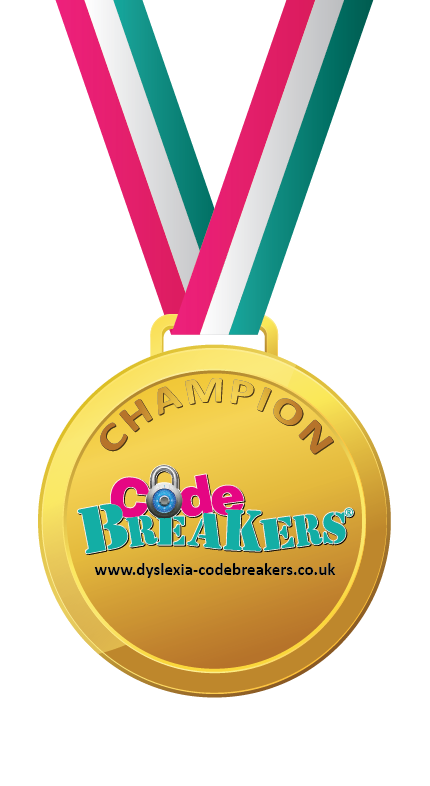 CodeBreakers® has been designed to enable staff at all levels to deliver the programme without specific dyslexia training. CodeBreakers® workbooks can be printed and sent home for parents to use as homework. The FREE student progress tracker enables targets to be set, progress to be analysed on a timeline and provides evidence of progress for funding and OFSTED at the click of a button. How can schools monitor progress? The FREE Student Progress Tracker is provided for ‘tutors’ to enter completion dates of each workbook, individual to each student. Is CodeBreakers® for 1:1 or group work? Schools can use CodeBreakers® for both 1:1 and group work if students are working on the same workbook. The games are great played as a group and extra sheets can be printed where required, if there are more than two players. What equipment will I need to use CodeBreakers®? You will need access to a printer, a device which can read a USB/memory stick, Adobe to read PDF documents but you can download this FREE, Excel to access the Student Progress Tracker and Powerpoint to listen to the sound presentations. We’re aiming to have the sound presentations on our You Tube channel too. CodeBreakers® is suitable for students with dyslexia and those looking to boost literacy skills. Still not sure if CodeBreakers® is for you?